The surprise move by UK-based Tesco to open multi-brand retail stores in India with an initial investment of $110 million is expected to change the contours of the sector next year. Experts say the brand’s entry into the country, more than a year after the government relaxed the multi-brand retail policy, may prompt those sitting on the fence to invest, too. This is quite a contrast to what pundits have been saying so far. Across the sector, the standard forecast was no foreign direct investment would be seen in multi-brand retail until the 2014 general elections. 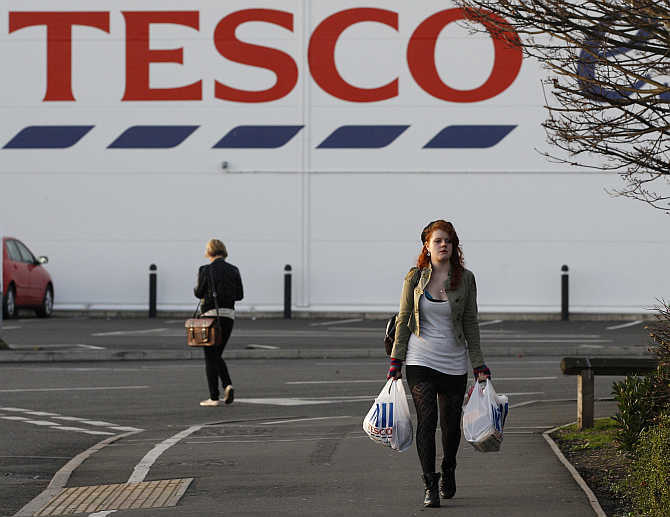 Image: A shopper leaves a Tesco store in Loughborough, central England. Now that one player has moved forward, others may follow, once they find Indian partners. Recently, Walmart called off its association with Bharti, while Carrefour is still without an Indian partner. Japanese retail chain Aeon is focused on the India market as well and may invest in 2014. Beyond FDI, too, the coming year is likely to hold promise for retail. Mukesh Ambani’s Reliance Retail has emerged as a big player, with a revenue target of Rs 40,000-50,000 crore in the next few years. For 2012-13, the company’s retail business clocked revenue of about Rs 10,000 crore (Rs 100 billion). 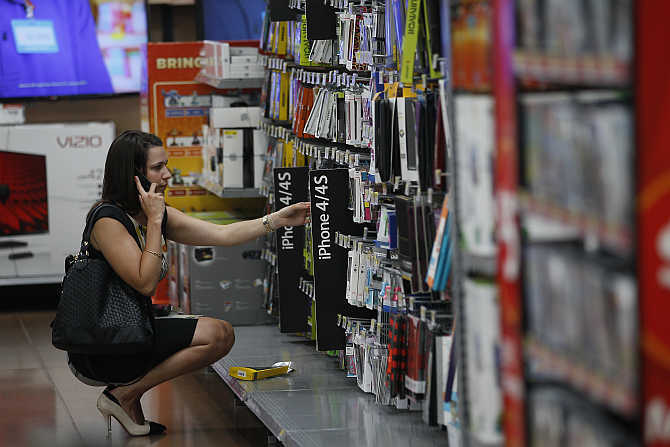 Image: A customer shops at a Walmart Supercenter in Rogers, Arkansas. Next year, competition between Reliance Retail and the Kishore Biyani-led Future Group will be worth looking at. For 2014-15, Future Group, India’s largest retailer in terms of revenue, expects to clock Rs 7,000 crore from the fashion business alone. Debt reduction is another critical area for the Biyani group. It has already reduced debt from Rs 7,800 crore (Rs 78 billion) a year ago to Rs 4,500 crore (Rs 45 billion). 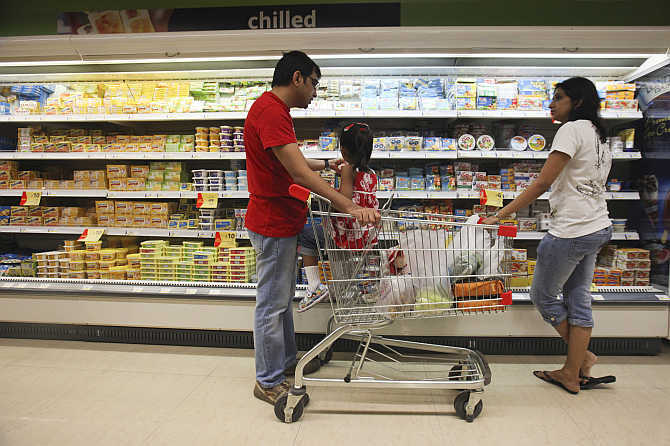 Image: People shop in the chilled foods section of a Reliance Fresh supermarket in Mumbai. On the impact of the 2014 general elections on the retail sector, he said, “It will only build hope, aspirations and growth.” But what about competition from online? “Right now, it’s too small,” he says. Biyani is right. Without travel transactions, e-commerce is just a small fraction of the retail pie, estimated at $500 billion. But online majors are bullish on the times to come. Sachin Bansal, co-founder and chief executive of online retail major Flipkart, for instance, said next year, e-commerce would become more mainstream. Flipkart may achieve gross merchandise value of $1 billion in 2014, a year ahead of the target. Right now, the company is at the $500-million mark. 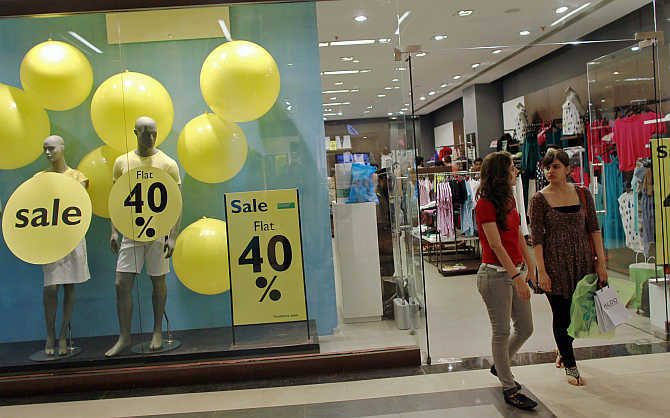 Image: Shoppers leave a retail store inside a mall in Mumbai. Snapdeal chief executive Kunal Bahl said his company, too, would get to the $1-billion revenue mark next year. It is estimated by the end of next year, half of all online purchases will be through mobile phones, against the current 30 per cent. In 2013, single-brand retail, in which 100 per cent FDI is allowed, remained fast-paced, in terms of clearances. It is expected next year will see more action in this space - store planning from furniture giant IKEA and store openings from the likes of H&M. 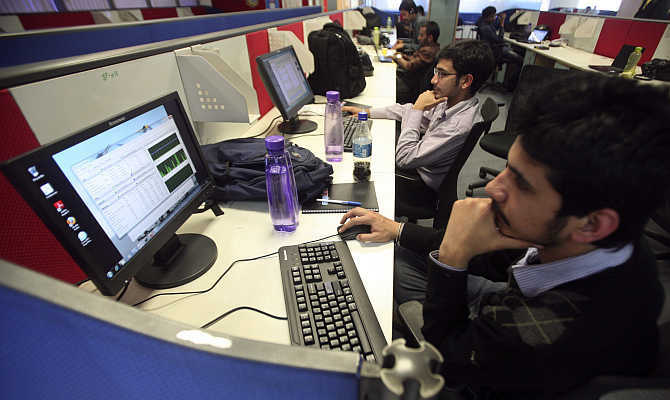 Image: Employees of Snapdeal.com work inside their company office in New Delhi.